Is Your Self-Perceived Weakness The Source Of Your Greatest Strength? We've all heard the tale of David and Goliath. I even wrote a post awhile back about common misperceptions we have about strengths and weaknesses. I'm going to pick up on these prior discusses about how your weakness could actually be your greatest asset. I'm only 5 7" and I was always one of the shortest kids in school. I've had many thoughts about how much better I would be if I was a few inches taller; I'd be able to cover more court and volley more shots. What I experienced sounds like a fair assessment. But we are unable to change our physical traits and genetic makeup. Many of us have asked the questions if its environment or genetics that allow the greatest to be successful. If only I was 6 foot maybe I too could have played professional squash. I know I've got you wondering now how can my height be an advantage? Let me explain. 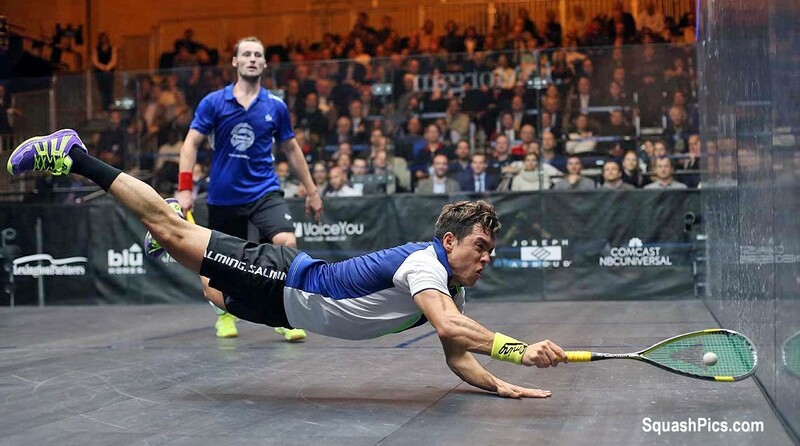 Squash is a sport that anyone can play. There are all different sized players on the tour. Rodriquez, Gaultier and Au all demonstrate that a shorter man can be a great squash pro. Nicol David has done the same on the women's side. But how exactly does my size give me an advantage on the squash court? Let's find out. First of all I have to be faster, quicker to react and more efficient with my movement. If I was a few inches taller perhaps I would reach for balls more and not be as fast off the mark. So yes I may have to work harder to get more balls back, but this makes me faster and fitter. Rodriguez must be one of if not the fastest and he's one of the shortest. He is almost too fast for his own good though and often hits shots that must make David Palmer cringe. Being shorter in stature means that my shot selection is even more critical. I can't get away with floating shots to the front of the court. I have to send my opponent up there under pressure or I'm in trouble. A lot of taller juniors I see get away with lots of terrible shot because they can dig a lot back. If they played against more polished opponents they would also learn quickly that you can't just float a ball with no purpose to the front of the court. I still want to play an attacking style of squash so I just know I need to set up better openings and be more exact with my attack. Can you see where I'm going with this? Because I don't have a go-go gadget reach I am forced to make better shot selections and execute more precisely. I know this so I've spent hours and hours working on my short game. Annie Au must be the best example of this on tour. She is not very quick, but because of this she has worked on other areas which become much stronger. I doubt Au's style of played would have been as it is if not for her size and speed. 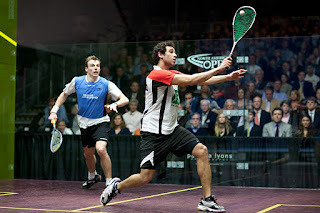 There are also a number of things that are advantageous to shorter people in squash. Because of my size it is harder for me to get jammed by a shot. If a ball is hit right at me I have less area to get my feet out of the way to get set. I am also lower and have to lunge less deep compared to taller players. When I play a tall person I always hit shots low and right at them. Also, because of my height I have a more compact swing than taller players. I can get my swing set quicker and when I contact the ball at proper spacing I am slightly closer to the ball which means means more control and balance. I have more control just like when you move your hand up higher on your grip. As you do this you are closer to your projectile (the ball) and you will generally be slightly more accurate. My balance is better than a taller person because my centre of gravity is lower and the radius of my swing is slightly smaller. There really are lots of advantages to being short in squash and it's helped me become the player I am. I can say honesty now that my height is not the reason I didn't become a top psa player. It has a lot more to do with quitting squash at the age of 14 for 5 years. A couple of months ago I had knee surgery. I also believe that this will make me a better player when I come back. I will enjoy being on court more and will try and think less about the outcomes. It also gives my mind and body a bit of a break, which is probably long overdo. On top of this having this injury has made me more aware of taking proper care of my body and I plan on doing more preventative training to stay stronger and healthier. The same could very well happen to Ramy. I believe that there is a positive side to these injuries if we stay open minded and driven to succeed. But just like our self-perceived weakness, if we only look at it as an awful thing with no positive side to it we are missing out on a lot of opportunities to learn and grow from our experience. Nobody ever wants to think that an injury can be a positive experience, but I believe they can have lots of positive consequences and when we come back from them we will have learned a lot that we just never would have if we never went through it. Guess this is where the saying, 'what doesn't kills us makes us stronger' comes from. Another example of the more we're challenged the more we gain is in sport psychology. The bigger the challenge you face the more you have to gain and improve from. This is the approach you must have when things seem to be going against you. Imagine if everything was easy in your matches, the ref made all the calls in your favour and you never got down in any of the games. This is a level of comfort we would all enjoy, but this situation does not present us with the best chances to improve our mental game. I hope I've given you lots of reasons to rethink how you perceive your so-called weaknesses. The only detrimental part of a perceived weakness is the lack of confidence you have because of your destructive interpretation of it. Perhaps looking at your perceived weakness in a new shade of light will let you see that it actually helps to make you stronger and develops other strengths you would not have otherwise. If we don't get pushed and have things too easy we won't become tougher and will never reach our potential. I'm a big Toronto Blue Jays and Marcus Stroman fan. Stroman's famous line is 'HDMH' which stands for 'height doesn't measure heart.' He's only 5 8" and asked the Jays to lower his height listed on their program to his proper height. He embraced his perceived weakness because he realizes that it's his greatest asset and is what gives him an advantage over his competitors. He uses his stature as motivation to work harder and has become such a positive individual and more mentally tough because of it. Surely this wouldn't have happened if he was an average height for a major league pitcher. He wants to prove all of his naysayers wrong and is one of the most motivated athletes in all of baseball. There's nothing quite like demolishing stereotypes and proving not only to yourself, but to others just like yourself how often we misjudge people. If you need some help believing that your perceived weakness is an asset use vicarious learning by looking at someone who has a similar perceived weakness and is successful. And if someone hasn't done it yet, remember that doesn't mean it can't be done. If you're confident and keep working at it you can do more than you ever thought was possible. Be the next David, Rodriguez or Stroman or better yet be the first of you and become someone else's example and motivation! The sooner you change your attitude towards your perceived weakness the more you will benefit from it. Not being good at something or being titled 'genetically inferior' for your sport means you will make up for it in another way and will be stronger because of it. This is the reason anybody can play the most physically gruelling sport in the world at the highest level. Lastly, be sure to check out my new online squash store at SeriousSquashShop.com I have men's and women's shirts, tank tops, sport psych wristbands, hats and bandanas! Enter the code 'SERIOUSSQUASHROCKS' to receive 15% off your order! Thanks for reading and supporting Serious Squash! Today I'm finally getting around to a post on mindfulness. I found notes in a journal I wrote as a kid about some of my goals and it included meditation and learning to control my mind. As a kid I struggled with visualization and controlling my emotions when I played. Generally it does get better with age and experience, but I still believe there are lots of ways that we as coaches can help our athletes train and improve their mental game. Some people seem to be naturally gifted at staying positive and giving a 100% effort, or for maintaining their focus. I unfortunately was not one of those that found the mental game natural or easy to improve. In retrospective it's simple to look back on previous matches and years of tournaments and come up with a more positive learning experience and outlook for them. I think I struggled with the mental side when I was younger because I thought I could get where I wanted simply by working hard and putting in the time. I know now that more isn't always better and it's not always about trying harder. Often in matches I would have a tactic and not stick to it and get upset at myself. Other times I would play 1 style of play and not adjust regardless of what was happening. I always tried to play perfect squash and when things started to unwind a bit I would make things even worse by getting angry. Any of these scenarios sound familiar? I remember when I was a junior being asked to visualize myself play a match and I could never imagine myself playing well and winning points. Since I couldn't picture myself playing as well as I actually could in real life so I quickly abandoned this approach and I know now that this just meant I had lots of room for improvement. Imagery, staying positive, confidence, handing pressure, managing emotions and staying focused are all things I've struggled with over the years and especially as a kid. Thankfully there is a thing called wisdom. Over the past few years I've read a lot of books on sport psychology and mostly from experience I have learned to compose myself and control my emotions better on court. I've learned an approach that works best for me and it's about never getting angry for missing my target and only focusing on making good decisions. Nowadays I can get over missed shots far quicker and even poor selections because I understand how many decisions are made in a single point and even though I've played squash for most of my life, I still make some poor choices. You can see how psychological draining this game can be if you go in with the wrong mindset. Most of us take our loses way harder than we should and we have trouble seeing that they provide the best opportunities for us to learn. This reminds me of John Wooden's quote where he says that 'the only thing worse than losing too much is winning too much.' When I was a kid I never would believe that quote, but I do see the wisdom in it now. Don't get me wrong, I still hate to lose, but when I recap what happened I always focus on the process and learn from it. Winning all the time can feed into your ego and makes you play squash focusing on the outcome as opposed to the process. Don't get too comfortable and afraid of losing sometimes, believe it or not it's good for you! Okay, so let's get back on the topic of mindfulness again; I first heard of this approach in sport from Phil Jackson in his book Sacred Hoops. I thought it was such a unique idea so the next time I went on court I tried to play like this. By mistake I misinterpreted mindfulness for 'mindless' and so I went out trying to keep my head completely blank; safe to say it didn't go well! I didn't really give mindfulness too much thought for awhile longer until I read an article on Novak Djokovic and how he practices mindfulness for 15 minutes everyday. 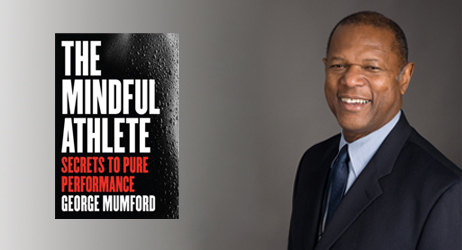 A couple of months later I find George Mumford's book which is titled The Mindful Athlete (pictured above). Mumford is the sport psychologist that Jackson referred to earlier in his book and he worked with Michael Jordan and Kobe Bryant along with many other top athletes. Finally Mumford was able to clarify a lot about mindfulness and what it is and isn't and how to practice it. Mumford talks about how mindfulness if learning to quiet the mind through meditation and with lots of practice you can learn to become better equipped at emptying your mind when it's carrying around destructive thoughts that we habitually have. I think this is where Djokovic is at now; he is able to keep his mind out of the way in the pressure of competition and instead of focusing on staying positive or some other sport psych phenomenon he is able to get his mind into the right zone or mindset which allows him to play his best. It's quieting the distractions and just playing. The more control you have over your thoughts and focus the quicker you can catch yourself drifting and losing your train of thought and the better able you are to get yourself back into this optima performance zone. When you are in the zone and mindful your focus is taking in the optimal percentage of internal and external stimuli without being consciously aware of this so you can pick up only what is relevant to the task at hand. Mumford also talks about how enjoying and having fun playing is the best method for competing with a mindful state. This must be an terribly challenging thing for people that once played for the love of the game, but now play for other external reasons. If money or stats if your focus when you play your mindset isn't going to be optimal for playing your best. Of course we want to win a trophy or prize money so how do we not focus on that? I believe that the more pressure that is on the line the more important mindfulness becomes to an athlete. I also believe that an athlete needs to be introduced to this skill earlier than later as it takes years to really master, just like any other skill. Regardless of the sport it will be interesting to see how the Olympians deal with the pressures in Rio. So where do you go from here? Well you can ask yourself if you're having trouble with your nerves, focus, confidence, emotions or the ability to play your best in tournament play. If you answered yes to any of these maybe it's time to start spending a few minutes per day meditating. I've read a number of books on zen and I know there are certain ways you should sit and breathe, but I feel you can personalize this to your needs and ability. If sitting or lying down works better for you try that. Some people like to keep their eyes open while others closed. You may notice that your mind is full of ideas and you're having a lot of trouble sitting still let alone focusing on what you're doing at that very moment (which of course is not exciting!). It's an amazingly difficult yet simple concept which is an integral step to becoming more mindful when you compete. One thing I did the other day which I'm a big fan of is floating. Below is a picture of a float tank which I find makes relaxing and meditating a bit easier. There is no worrying about how long you've been meditating for as you simply sit in the tank until the music begins to play an hour and fifteen minutes later. The tank is also a sensory deprivation tank which means the water is kept at your body temperature and because of the large quantity of epsom salt you float so you cannot feel anything. It's also pitch dark and quiet so it's an ideal setting for focusing on your breathing, relaxing and being mindful. Because you book the time you don't procrastinate about doing it and you turn your phone off so there's no distractions. There's no cheating and looking at the clock or sending a quick text. If you're having trouble meditating I suggest you find a local float tank deprivation centre and give it a try. I often find the time flies by when I float. When it comes to meditating at home I like to set my timer for 15 minutes first thing when I get up and just sit there. If my thoughts begin to drift off to my breakfast or what I have to do that day I will focus on my breathing and maybe even begin to count my breaths. As you do this your focus becomes more in the present and mindful. I've gotten better at this, but it really is something I will always have to practice if I want to learn how to spend more time in the present and control my thoughts, emotions, breathing and focus. Some of us lose our concentration easier than others and if you do I think you will also find this extremely challenging, but also very beneficial when you begin to see improvements in your focus and squash game. I still think the mental game is an area that we know less about compared to other areas of sport training. It's also still an area that is difficult to teach because some athletes don't buy into it or take it seriously. It can also be difficult taking into account for individual differences. Only you know what you're thinking when you're training and competing and the first step is becoming aware of your thoughts, both destructive and positive ones. I believe coaches have a responsibility to introduce this topic, but it's up to the individual athletes to do this on their own time. If you feel the mental game is your weakest point you should make this your top priority on your training program. Do you sign a song in your head to distract yourself when you compete? 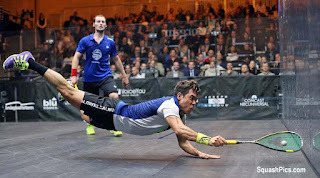 I know a number of people who do this and I think this is just a crutch and isn't the optimal focus for playing your best squash; it just represents the trouble we have quieting our mind and finding a consistent level headed mindset for our matches. I believe this stems from the over stimulation we deal with as early as we are born. Kid toys are not basic stuffed animals anymore because most kids would prefer something that beeps and has lights. Eventually kids see a television or video games and of course cell phones. We have all fallen into these devices and I haven't looked into research, but I assume has repercussions for our psychological well-being and negatively impacts our mental game when we play sports which require a great deal on thought control. Technology has a lot of benefits, but will also make the ability to disassociate from them even more critical to our overall happiness, well-being and success on the squash court. I really believe having a single tactical goal suits me best when I compete and I've played so much squash that if I'm in the right quiet mindset I will know how to adjust without overthinking things or getting upset for not making an adjustment quicker. I know in previous years I would play so narrow minded with a single tactic that I would fail to adapt my game properly and afterwards I would think to myself, 'why didn't I do this or that?' If you're in the right mindful mindset and you have the expertise I think you will be able to make these adjustments instinctively and much faster. Lastly, don't forget that sports are supposed to be fun! If we try too hard and take things too seriously we will rarely be in our optimal zone for playing our best squash. This is why I designed my most recent sport psych wristband slogan that says, 'play smarter, not harder' (a pic of a similar band is below). I think a lot of us competitive people focus so much on winning that we fall into this trap and according to Mumford is not the optimal state of mind for playing in the zone and mindful.